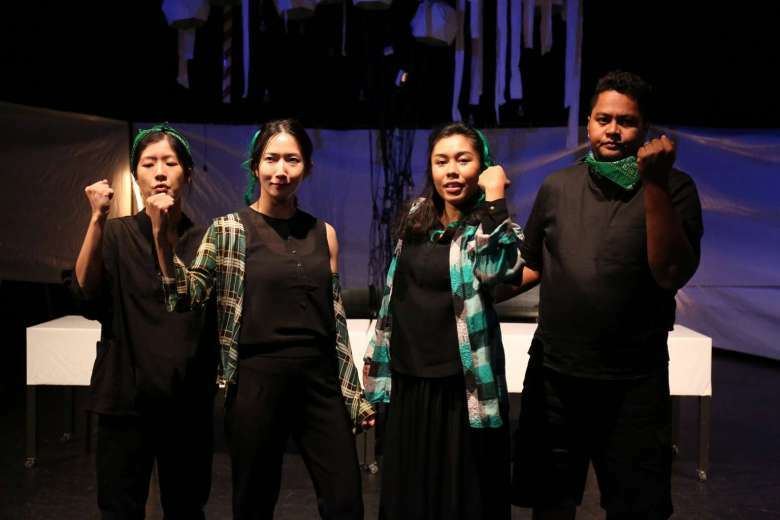 As part of The Twenty-Something Theatre Festival, the festival’s creative producer Tan Kheng Hua commissioned two playwrights – Joel Tan and Irfan Kasban – who are already making a name for themselves within the industry to present headlining works. Kasban’s Trees, A Crowd is staged as the headlining work for the festival’s first weekend. 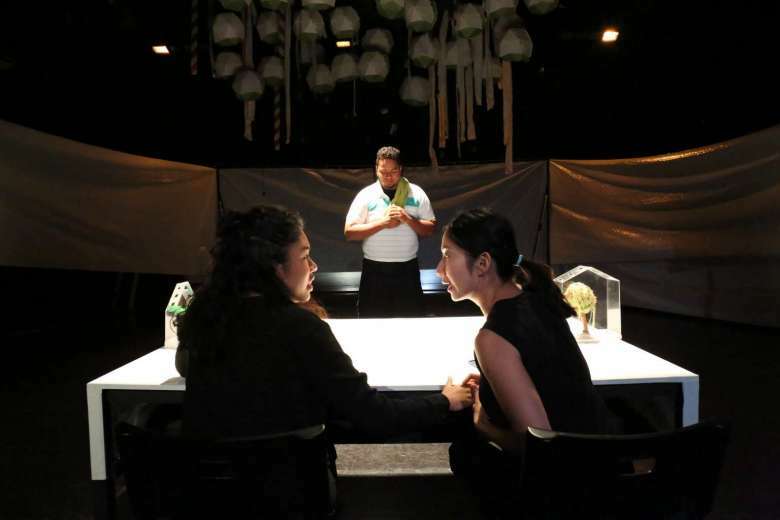 Held at the Goodman Arts Centre’s Black Box, the one and a half hour-long play staged is poignant and incredibly relevant. It is a choice well-made to have this play wrap up the first weekend of the festival, while we beckon the welcoming of the second. A highway has to be built and sacrifices have to be made for it to be brought to fruition. In its proposed path, a 150-year-old tree stands and in an alternative solution, a 50-year-old tree planted by the former Prime Minister is rooted. What are the questions that we need to ask and what are the considerations to be made, before a final outcome is deduced? Trees, A Crowd is about a volunteer-based organisation named The Society of Flora and Roots (SoFaR) and how they go about debating, signing petitions and eventually hosting a public forum to decide which tree should be uprooted. 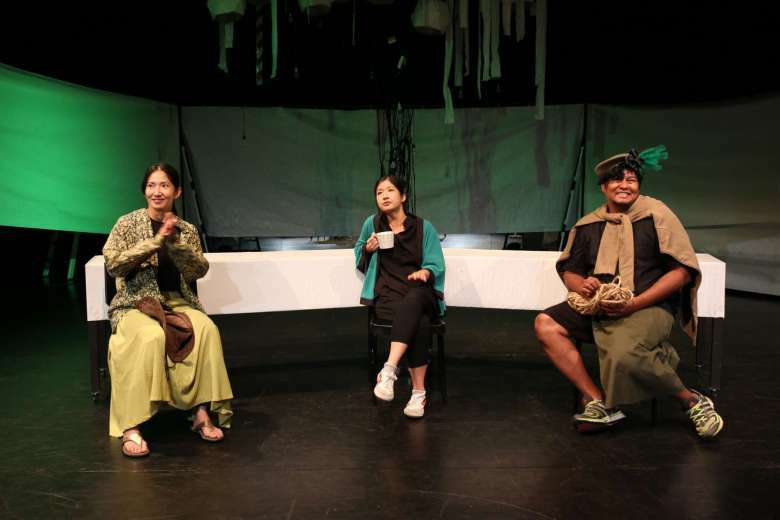 Between our preserved natural past and a planted history, the cast of four – Jo Tan, Faizal Abdullah, Shafiqah Efandi and Chng Xin Xuan – opens up the conversation and gives voices to all the thoughts that we choose to never say. Despite the seriousness of the topic at hand, our expectations were completely thrown off, in a good way. Hard-handed preaching and propaganda were nowhere to be found. Instead of forcing idealistic messages down our throats, we found ourselves laughing to constant intended puns and ridiculous jokes. Be it about the environment, stereotypical millenial behaviour or just the relationships within the group itself, audience members were always shown the humourous side of things. Little did we know that we were actually laughing at ourselves, because what was shown on stage – for better or for worse – is how a lot of us react to matters of the environment, our culture and history as a country, and a generation. We must say that the text is impressively clever in interweaving humour with what has to be said and thought about. Who says that every theatre show with a message has to take itself so seriously? Sometimes, loosening the audience up might be key in getting them receptive to what you are trying to say. The four actors play multiple characters ranging from realistic to ridiculous. The different characters that feature as well as audience interactions every now and then kept us on our toes, and earned reactions for their many gem moments. Be it laughter or just attentive listening, the audience members are invested in the action from beginning to end. At least ten characters come up on stage to give a glimpse of their concerns on the trees, and it is great that as audience members, we are given plenty of perspectives to ponder on before encouraged to take a vote ourselves. Beyond the context of the show, the knowledge presented are facts that we take home with us and will come up again whenever a new environmental debate comes up. The ensemble shares great camaraderie and chemistry, which can be witnessed throughout their interactions on stage. And paired with a beautiful set is all the show needed. Just tables, chairs and a tree made up of cables and paper lanterns overlook all that is happening. It is a silent figure that shares so much space, but yet, so invisible at the same time when all the action’s taking place. Despite it being cliché, the ending tableau of the stage lights going out to make way for the centre-piece tree that finally glows beautifully before shedding its leaves, left a strong impression in our mind’s eye. With the cast members’ backs turned and the soundscape of construction takes precedence over folk songs being sung, we have no choice but to look back at ourselves and reflect: What is our relationship with this place? Can we truly save everything that is ours? What is ours to keep when the past always has to make way for the future? 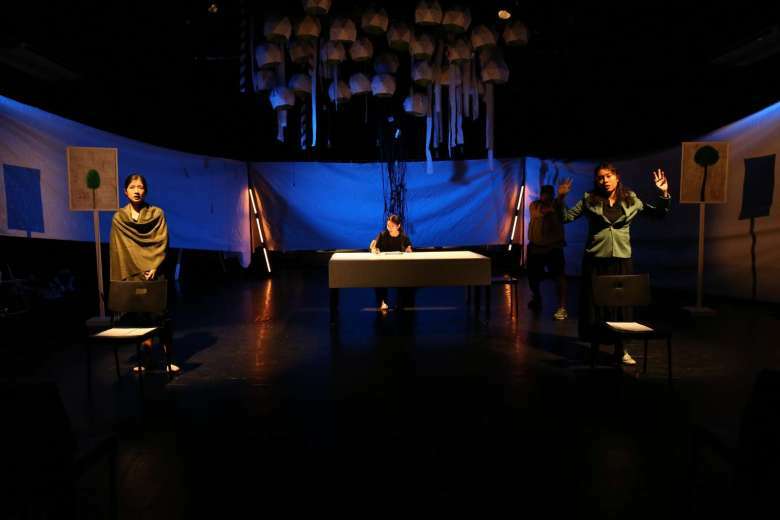 Trees, A Crowd has a last show tonight at Goodman Arts Centre’s Black Box, 8pm. Purchase your tickets here.